Chocolate Cake with 12 layers of smooth chocolate filling, 12 layers of moist and rich chocolate cake, topped off with a layer of silky semisweet chocolate ganache is the most decadent chocolate cake I’ve ever tried! 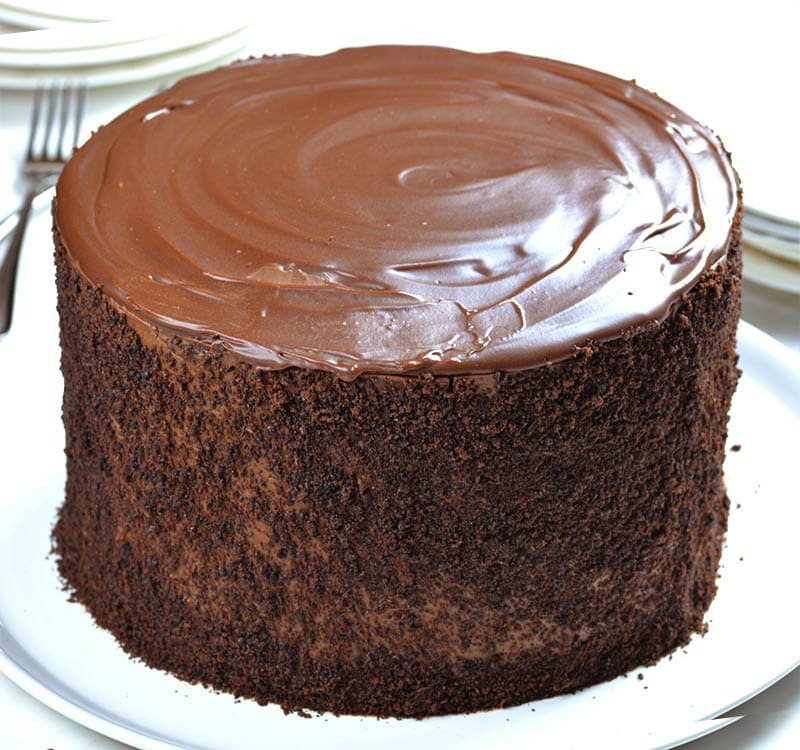 If you are a true chocoholic you must try this amazing Chocolate Cake recipe, too! It’s fudgy, chocolatey, moist, and made from scratch! This chocolate cake with 12 layers of cake, 12 layers of filling, plus chocolate ganache on top is real multi-layer chocolate madness! From birthdays and weddings to holidays, we all define important moments in our life with cake! 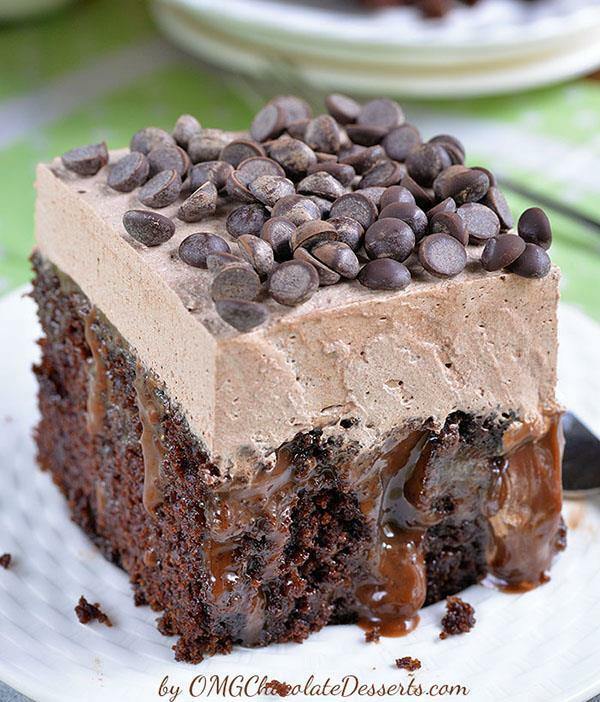 I can’t imagine better choice than rich and decadent CHOCOLATE CAKE! Holiday season is upon us. 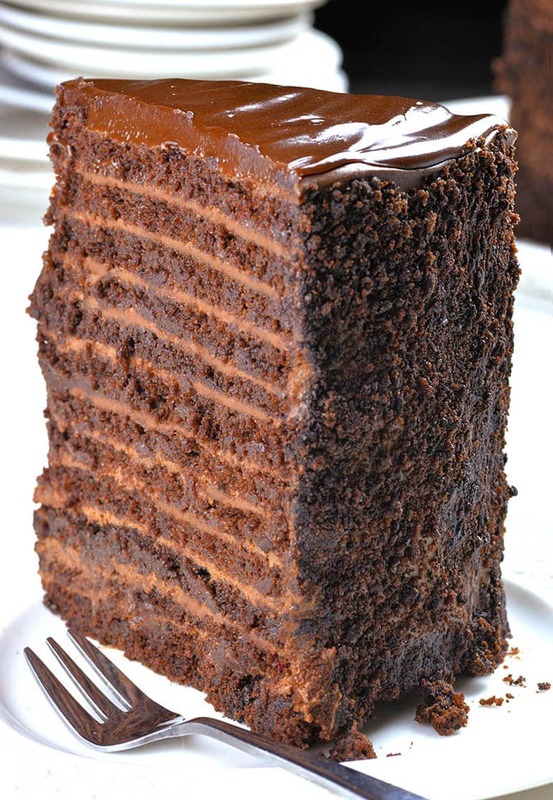 Thanksgiving, Christmas or New Year are perfect chance to try this 24 Layer Chocolate Cake recipe. However, it’s really special cake for special occasions! If you don’t need that big cake, you can easily cut the recipe in half and make just a simple 12-layer cake. How to make chocolate cake from scratch? Nothing can compare with real homemade chocolate cakes made from scratch. It maybe seems like a lot of work, but trust me, it’s not! You can easily make cake from scratch like a pro even if you don’t have much experience in the kitchen. Start with sifting together dry ingredients: flour, cocoa, baking soda, baking powder and salt and set aside. Then separately combine wet ingredients cold coffee, milk and vanilla extract, set aside, too. In a mixing bowl at medium speed, cream butter and sugar together. Add eggs one at a time and mix to combine. Running mixer on low speed, alternately mix in dry and wet ingredients, starting and ending with the dry ingredients. Divide the batter between the two cake pans, smooth the tops and bake at 325 degrees for about 30-35 minutes or until toothpick inserted in the center comes out clean. Cool the cakes in the fridge and then cut each cake in 6 even layers. Meanwhile make Chocolate Filling. Bring heavy cream and one cup milk to a boil. Mix eggs, temper them by slowly whisking in about half of the boiling milk and cream mixture. Add the vanilla extract and then pour the tempered eggs back into the remaining milk mixture. While simmering, add the sugar and flour mixture. Then add the cornstarch slurry, stirring constantly until thickened. Finally add the chocolate, remove from heat, let it sit for a few minutes then stir until all the chocolate has melted. With a hand mixer, beat the custard for a couple of minutes and chill in an ice bath. 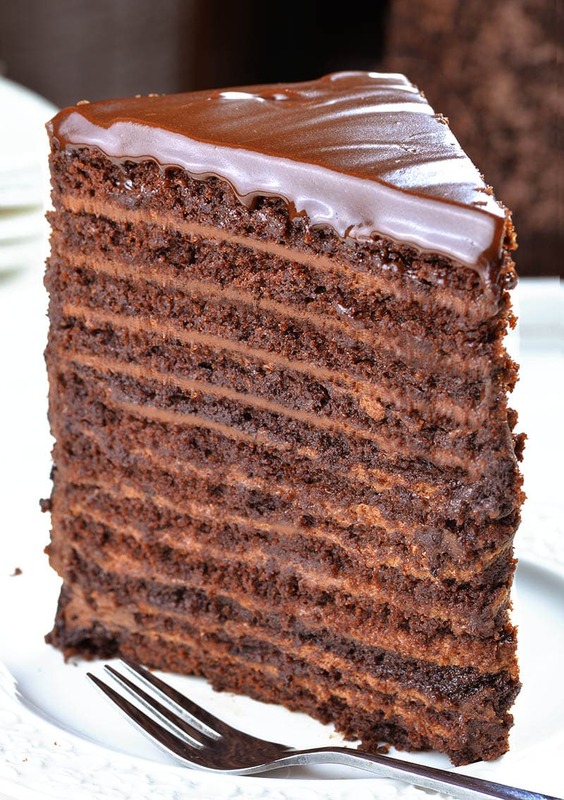 Assemble the cake by stacking cake layer, thin layer of chocolate filling that acts like a glue and continue with remaining layers and finally top with chocolate ganache. Chill in the fridge and your 24 Layer Chocolate Cake is ready to be served. Enjoy! Craving for more Chocolate Cake Recipes?!? If your chocolate cake has three chocolate layers instead of one? 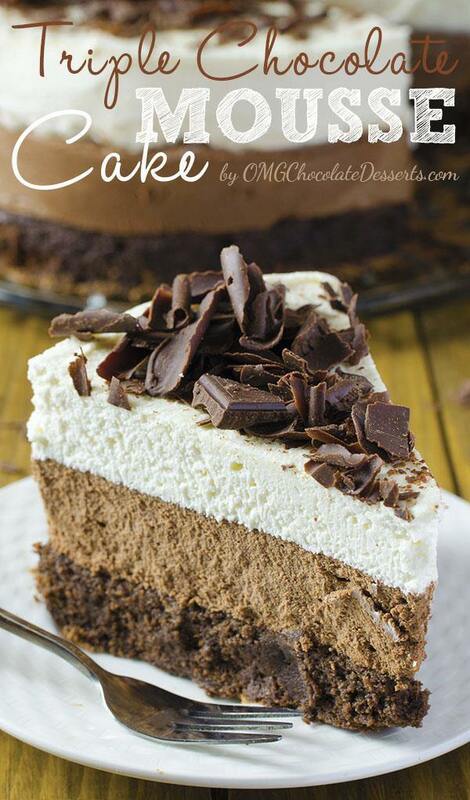 Then, we are talking about one of the most decadent chocolate cake – Triple Chocolate Mousse Cake. Chocolate Cake with 12 layers of smooth chocolate filling, 12 layers of moist and rich chocolate cake, topped off with a layer of silky semisweet chocolate ganache! Preheat the oven to 325 F. Spray two 9 x 3-inch round cake pans. Line bottoms with circles of parchment paper, spray the paper and set aside. Sift together dry ingredients (flour, cocoa, baking soda, baking powder and salt) and set aside. Combine cold coffee, milk and vanilla extract, set aside, too. In a mixing bowl at medium speed, cream butter and sugar together. Add eggs one at a time and mix to combine. Running mixer on low speed, alternately mix in dry and wet ingredients (starting and ending with the dry ingredients). Divide the batter between the two cake pans, smooth the tops and bake at 325 degrees for about 35-40 minutes or until toothpick inserted in the center comes out clean. Cool cakes completely in the fridge. Mix flour and sugar together and set aside. Mix one cup of cold milk with the corn starch and set aside. In a mixing bowl, mix eggs and set aside. Bring heavy cream and one cup milk to a boil. Temper the eggs by slowly whisking in about half of the boiling milk and cream mixture. Add the vanilla extract and then pour the tempered eggs back into the remaining milk mixture. While simmering, add the sugar and flour mixture. Add the cornstarch slurry, stirring constantly until thickened. Add the chocolate, remove from heat, let it sit for a few minutes then stir until all the chocolate has melted. With a hand mixer, beat the custard for a couple of minutes and chill in an ice bath. Cut off the tops of cakes to make flat surface and save the tops to make the crumbs for decoration. Next cut each cake into six even layers. Place thickest layer on the plate. Place ring from 9-inch springform pan around the cake. Spread thin layer of chocolate filling, then place next cake layer. Continue with the following layers. If you have two 9-inch rings from springform pan you can assemble separately two cakes with 12 layers. Chill the cakes in the freezer for 1 hour and then stack the cakes to one another. Chill the cake until filling is firm, remove the rings from springform pan and spread on the outside of cake. Spread cake crumbs on custard to decorate the cake. To make chocolate ganache pour boiling heavy cream over chocolate and let it sit for a few minutes, then stir until it’s smooth and silky. Spread on top of the cake. 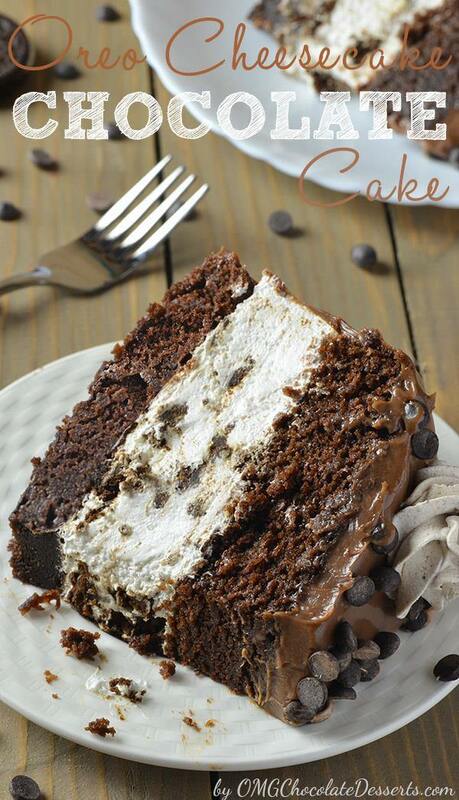 Thanks for sharing this decadent Chocolate Cake Recipe! 🙂 Instead of semisweet chocolate ganache, can it be used a dark chocolate? How easy would it be to cut one sponge in 6 layers?